If it had another name, I never knew, but the locals called it the Loney – that strange nowhere between the Wyre and the Lune where Hanny and I went every Easter time with Mummer, Farther, Mr and Mrs Belderboss and Father Wilfred, the parish priest. Now this is a widely acclaimed book, winner of the Costa Book Award, with film rights already bought and translations in the works. It seems a little perverse that I didn’t love it, but there we go. 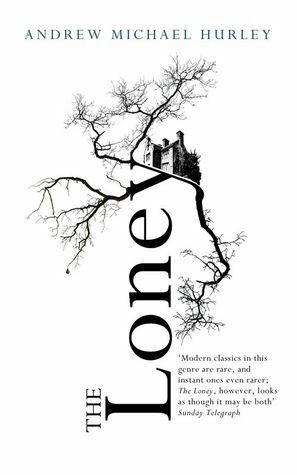 The author’s writing style is extraordinary, this is a very atmospheric novel and he is a master of creating a gothic atmosphere. It’s hard to believe that this is his debut novel! The characters are incredibly well put together, Hurley manages to not only tell a story through what he says but manages to create a second story entirely out of the things that her doesn’t say. I didn’t like most of the characters, they were so well written and some so dislikeable that I found that it ruined my enjoyment of the book. Most of the adult characters in this book made my blood boil: religious fanaticism does that to me, I guess. The story is told from the perspective of a nameless narrator, he recounts to us memories from his childhood where he spent an Easter with his religious parent, developmentally impaired brother and their church group at a shrine in a secluded part of Lancashire. Strange things happen while they’re out there due to a combination of their own behaviour and the ancient place they’re visiting. Religious fervour plays a key role in this book, making it even creepier in my opinion. I like a bit of subtext in my books, so you can read between the lines but this book was too subtexty to me – leaving me with a frustrated ‘what the hell did I just read?’ feeling once I’d finished. I had a similar feeling after watching the first Paranormal Activity film, people were raging about how good it was and I was left wondering if I’d actually just seen the same film. ‘It’s about what you don’t see’ doesn’t cut it for me, I’m afraid. So, the 3 stars for this book are based on my personal taste being the reason I didn’t enjoy the book rather than any issue with the writing. If you’ve read this book, I’d love to hear your thoughts on it! I don’t think I’d like that book either. Religious fanatics make my blood boil, too. It sounds like a bit of a waste of good reading hours. Just because something wins an award, doesn’t mean it’s a thumping good read. I applaud you on your honesty as a reviewer.